There’s nothing worse in the kitchen than the smell of burning food every time you try to cook. Having a dirty oven can take all of the joy out of cooking, and cleaning it can be a pain, too. 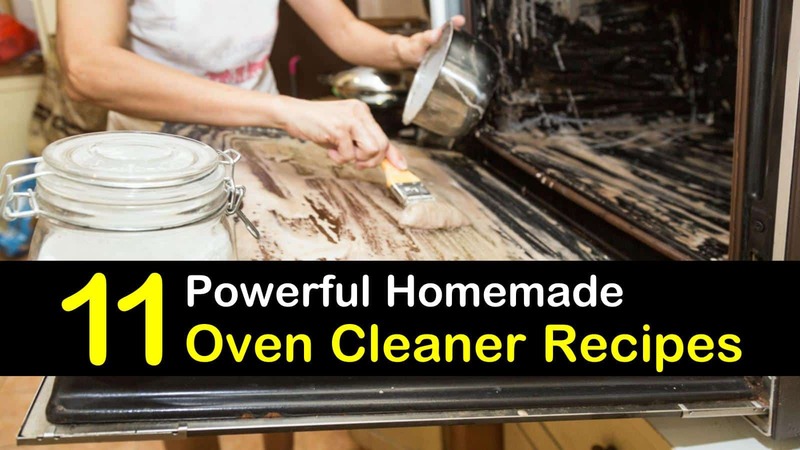 If you want to use natural cleaning products in your oven, then the best thing to do is to make your homemade oven cleaner — that way you know what ingredients are coming in contact with your appliance. Even if you have a self-cleaning oven, using that function might not be the most convenient or quickest process. If you don’t have time for the entire oven cleaning experience with your self-cleaning function, or if you can’t stand the smell it creates, then you might need to do it the old fashioned way — with a little bit of elbow grease and the right homemade cleaning products. Making your oven cleaner is easy and cheap, and can give you results that are just as good as commercial oven cleaners. 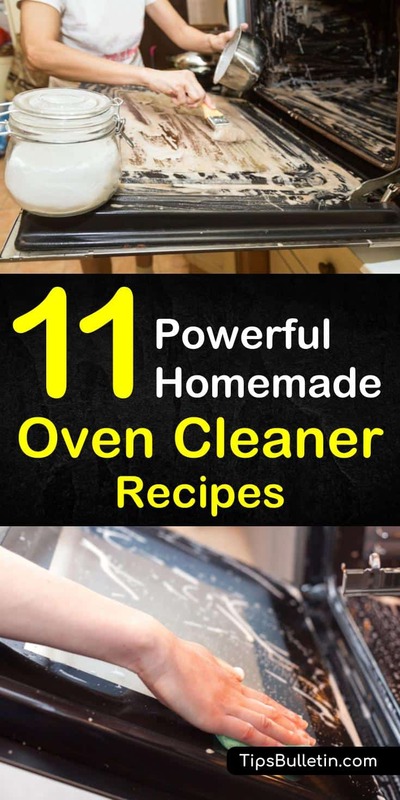 With these eleven tips, your oven cleaning experience will be as pain-free as possible. While this natural oven cleaner recipe is easy to make, getting the best results will require some time. However, it is one of the best ways to get the inside of your oven clean. To create the paste, mix the baking soda and water in a small bowl. The ratio may require some adjustment, but as long as you come out with a spreadable paste, then you’re doing it correctly. Once you have your paste, you need to take everything out of the inside of the oven. This means the oven racks, thermometer, and any cookie sheets or other removable items. Put on some cleaning gloves and then spread the paste all over the inside of the oven, avoiding the heating elements. The mixture will turn brown as you apply it, and it’s not a problem if the texture is inconsistent in some places. Leave the oven cleaning paste overnight, or for at least 12 hours. After the wait, take a damp cloth and wipe down all of the surfaces where you applied the cleaner. If some spots are stubborn, you can use a plastic spatula to scrape off the dried paste. Finally, put some white vinegar in a spray bottle and do a final wipe down with a damp cloth. Baking soda and water is a winning combination when it comes to the best way to clean an oven, and you’ll find that many of the best DIY oven cleaner recipes — including those on this list — contain these two ingredients. This is another natural oven cleaner that is free of harsh chemicals. This mixture can be used everywhere — on the bottom of the oven, on the oven door, and even the glass if needed. In a small bowl, scoop in the baking soda and add the soap. Add the lemon juice and then slowly pour in the vinegar. Gently mix everything until you have a paste. Slather the paste everywhere the oven is dirty, including on any oven glass. Leave the paste on for a few hours, or overnight if you can. When you’re ready to wipe it off, use a sponge or a cloth dipped in warm water. If you have a particularly dirty oven, then you may need to repeat this process a couple of times to get the spotless results you desire. There isn’t much difference between oven cleaning for gas and electric stoves, other than in the preparation. For gas stove burners, you need to remove the grates first. You can then clean the burners with a simple mixture of water and dish soap, or you can spray them with white vinegar for tougher spills or stains. You can use vinegar for the rest of the stove surface as well, but make sure you are avoiding the fuel ports — the spot where the gas comes out — and that they are clear of all blockages. Do not get the igniter wet while you clean. This recipe makes one of the best homemade stainless steel cleaners, so it’s perfect for people with a stainless steel oven. Combine the vinegar and water in a plastic spray bottle and then add a dish soap like Dawn. Next, add lemon essential oil before putting on the lid and shaking the bottle to mix. Spray your cleaner on your oven surface and wipe with a dry microfiber cloth for best results. The essential oil in this natural oven cleaner helps ensure you get a spotless shine free of smudges. Any homemade oven cleaner with baking soda and water as a base will do some heavy-duty cleaning, but, if you have a lot of baked on stains or greasy spots, you might need something a little extra in your cleaning recipes. You can add in a spoonful or so of salt to increasing scouring power. This will help loosen hard to clean spots and allow you to wipe away grease and grime. However, be careful with glass, as the salt could scratch it. This is one of the green cleaning methods that require turning your oven on and setting it on a high temperature. Start with two lemons and cut them in half. Squeeze the juice into a baking dish and then place the fruit in it. Pour some water into the tray, filling it about a third of the way. Put the baking dish in the oven and set it to 250°F, leaving it in for 30 minutes. Don’t be alarmed if there is a bit of smoke during this stage. You can leave it in longer if there are a lot of caked on stains. Remove the dish. After the oven cools, use a scouring pad or sponge to remove dirt and grease spots. The lemon will have loosened the grease, making it easy to wipe away stains. You can also use the lemon water that was left in the dish to help rinse the oven. Dip the sponge in the lemon water and scrub until it’s spotless! Use paper towels to dry off any remaining lemon water. This DIY oven cleaner is great for removing grime with just a light scrubbing. In a small bowl, mix the apple cider vinegar and sugar. After using the oven, apply the cleaner mixture while everything is still warm. Allow it to sit for about an hour. Lightly scrub with a sponge or damp cloth. If you’ve just finished cooking something and notice some dirt spots, sprinkle some table salt onto the bottom of the oven. The salt doesn’t need to cover every inch, but there should be enough for a thin layer to coat the surface. If you can’t wait until you need to do some cooking, you can set the oven to 150°F before sprinkling. While the oven is still a little warm, put on a pair of oven mitts and scrub the salt. Keep scrubbing until the build-up loosens. Using vinegar, spray the oven and remove everything with a damp rag. Dry with a paper towel. If you have a little bit of dirt in your oven, but you don’t quite need to do a heavy duty cleaning, then steaming is perfect. For everyday spills, get an oven-safe pot and fill it with water — it doesn’t matter if it’s cold or hot water, as you’ll be turning on the oven. Set the oven to 450°F and place the water-filled pot on the oven rack. Leave it in for 20 to 60 minutes, allowing enough time to loosen grease and dirt. Remove the container and, once the oven cools, wipe away the condensation with a cloth. The stains will come right off. If you want to clean your oven naturally, then the best thing to do is to prevent oil and grease stains from accumulating. If you are cooking something that you think might bubble over and drip down, then place an oven rack a rung or two below whatever is cooking. Cover the bottom rack with aluminum foil so it can catch whatever spills over. Make sure you are lining the oven rack and not placing the foil directly over the bottom of the oven, as this may cause a fire. One of the reasons people dread cleaning their ovens is because they wait too long between cleanings and the grease and grime get baked in, making it more difficult to remove. To avoid this outcome, wipe down the inside of your oven with a vinegar-soaked rag or sponge once a week. When it comes to finding a natural way to clean ovens, there are many methods you can choose. Whether you have gas or electric, stainless steel or an older model, we’re confident that one of our homemade oven cleaner tips will work for you. If your oven is looking cleaner than ever thanks to one of our tips, then share these natural oven cleaner recipes with friends and family on Facebook.